Bayern Munich are the football team based in the German city of Munich and are one of the best teams in World Football. Fussball-Club Bayern München or more commonly known as FC Bayern München, FCB, Bayern Munich, or FC Bayern. Prices for German League games are much lower than those of the UK and Spain with most tickets costing around €25Euros which is excellent value for money considering the level of football on offer. The current stars of Bayern Munich are French international Franc Ribbery and world cup winner Arjen Robben. The manager of the team is Pep Guardiola who has already an amazing record at the German Powerhouse. The main website for secondary ticket sales in Germany is here. Here at SafeFootballTickets.com we offer the best ticket websites which are 100% safe, secure and guarantee tickets for the game. With this you can be fully rest assured that when your purchase Bayern Munich tickets that you will receive them within plenty of time of the game. All ticket resellers guarantee to deliver your tickets either within Germany to a domestic address or to your hotel in Munich. On certain occasions the seller will post the tickets outside of Germany. Bayern Munich is one of only a handful of stadiums that will sell out for home games. Whilst the stadium is over 10 miles away from the centre of Munich there will definitely be local resellers outside. Unless Bayer are playing local rivals or Borussia Dortmund then tickets will be reasonable, expect to pay no more than €150 for a normal home game. 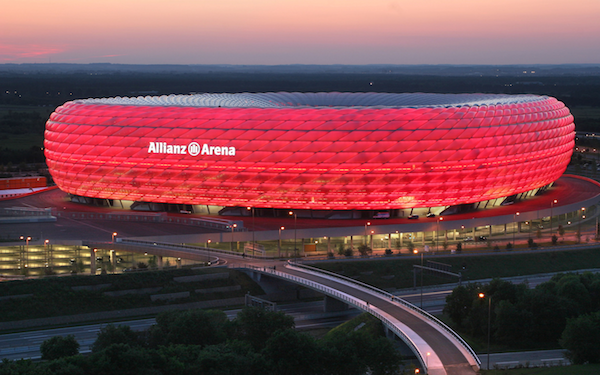 The Allianz Arena truly is one of the best stadiums in the world due to it’s unique LED light shell which can change colour when a goal is scored. For major Bayern Munich games only use recommended sellers, whilst tickets will be marginally more expensive the tickets will be guaranteed and you will be covered for any problems. So you have your tickets, what shall you expect when you enter? The Allianz Arena is one of the most technologically advanced stadiums in Europe and with this you can expect top of the range services. Payment for your food and drink in the stadium is completed via pre-loaded cards which can be purchased via machines away from the kiosks. This system allows people to pay for food, drink and other items rapidly and therefore keep queues to a minimum. This is definitely something that the English Premier League stadiums can take note of.